Welcome to the English language ScoutWiki. 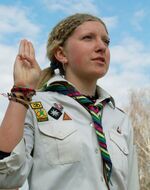 ScoutWiki is a free encyclopaedia which consists of Scouting and Guiding related articles. Anyone can participate by creating a new page or by editing an existing article. The English version of ScoutWiki currently has 3,070 articles in English. However, most of these articles could use some improvement, as compared to (e.g.) the Finnish, the French and the Dutch ScoutWiki's. To make this wiki a useful tool for scouts all over the world, your help is desired! Can we count on you? This page was last edited on 5 November 2018, at 11:27.